"Those were good moments," said UT baseball legend Charlie Gorin. Gorin knows about them all too well. He played a significant role in the rich Longhorn baseball tradition. "One thing about UT, we had good teammates," Gorin said. How about back-to-back national championship good! 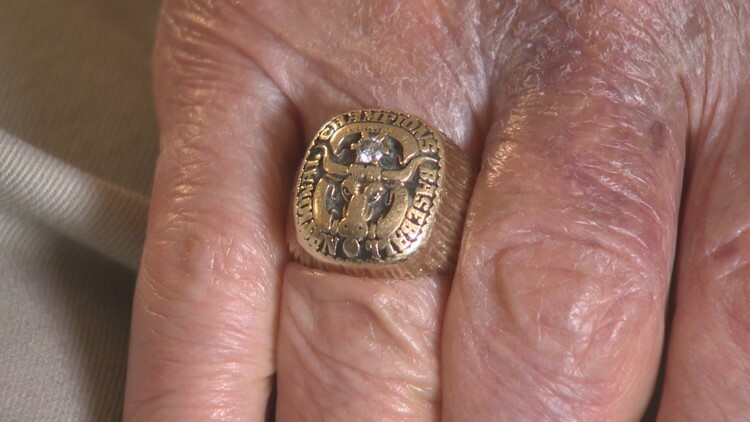 Gorin was a pitcher on the Longhorns 1949 and 1950 College World Series championship teams, and he has the bling to prove it. Two national title rings, one on his ring finger and the other securely stored in a ring box. "In 1950, we went to Omaha," Gorin said. That was the first year of the College World Series at the old Rosenblatt Stadium. 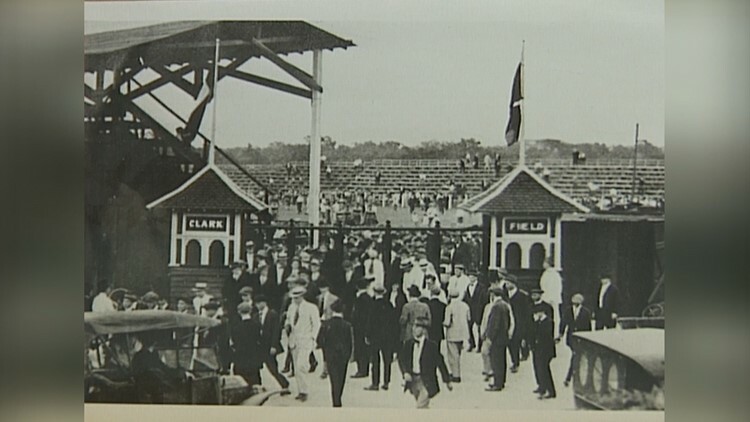 The 1949 CWS was played in Wichita, Kansas. As a pitcher, Gorin enjoyed Rosenblatt Stadium. 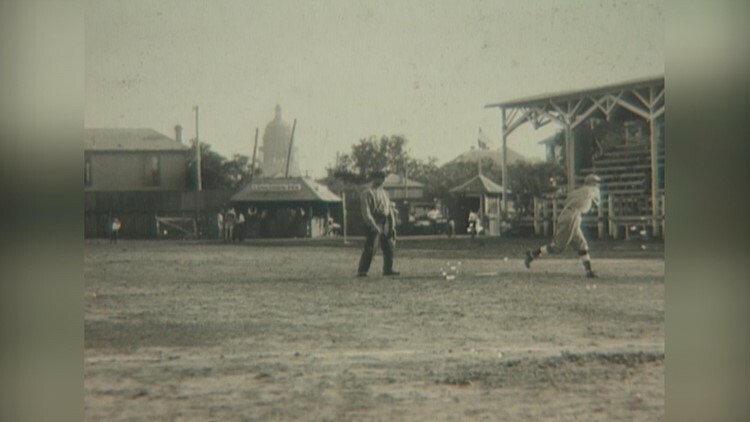 "Fences were long enough so they couldn't hit a home run off of me," Gorin said. Gorin's memory is remarkable, and his favorite memories are of Opening Day. His memories of those opening days date back to seven decades ago. He made it sound like yesterday, especially those which occurred at old Clark Field – UT's stadium prior to Disch-Falk Field – with the late, great Texas baseball coach Bibb Falk. "I made a pitch against Texas A&M, it went up on the hill, probably the hardest hit one hit there. It wasn't a proud moment, but it was something to see," Gorin said. But Gorin made up for it during an at-bat against the Aggies that same game. "We went on to win, I got a base hit and drove in Charlie Munson. We were a winning ball club," Gorin said. Gorin's baseball journey continued with a stint professionally with the Braves organization. "I was a rookie then, went up for a cup of coffee," Gorin said. 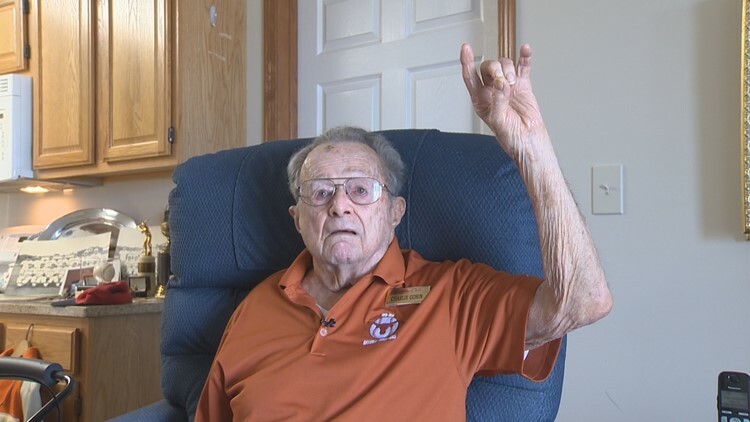 The Longhorn legend humors it all, just as he did when he was called to serve our country a second time during the Korean War, after serving in World War II. But baseball continued to be a part of his life. "We had a league in the Navy [while in Pensacola, Florida]. I ended up teaching and coaching cadets and playing ball at night," Gorin said. After a number of years playing minor league baseball, Gorin returned to Austin to begin coaching high school baseball, then retired in 1990 as a principal. Fast forward 28 years, Gorin and his contributions to this great game were celebrated at Lakeline Oaks Retirement Community. Gorin is 91 years young and still full of love for baseball. "Baseball has been good to me," Gorin said. He still receives autograph requests weekly in the mail and walks with a baseball bat. And he holds his horns up with pride.